In 2000 $2,300,000 in Transportation Enhancements funding went to a unique project in New Orleans, Louisiana where Louisiana State University?s (LSU) Medical Campus is located. The campus itself is located west of the French Quarter and is separated by the elevated Interstate Route 10. With on ramps and off ramps located within a close proximity to the campus and an equally busy Clairborne Avenue beneath the interstate, the area was not a very pedestrian friendly place. The hazards of the area culminated in the death of a medical student. To increase mobility and pedestrian safety of the area, LSU matched the TE funding with $7,083,000 in local funds to construct a pedestrian bridge that stretched 5 blocks or approximately 1/3 of a mile. 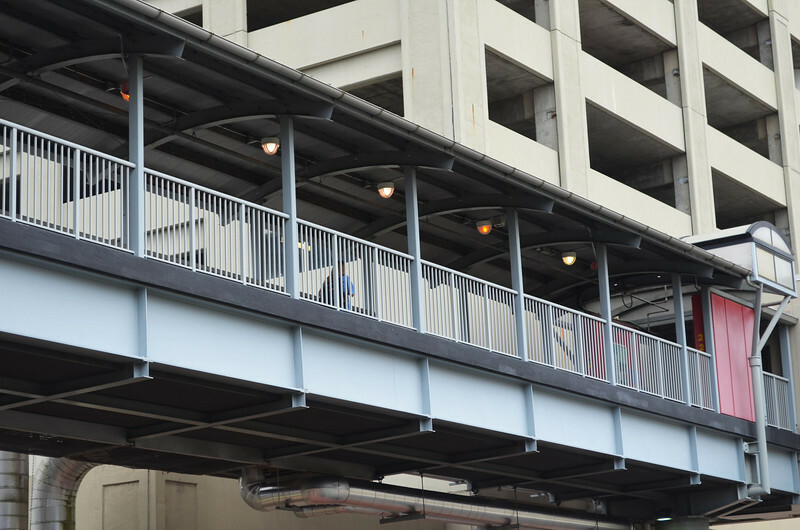 The walkway runs along Gravier Street and provides safe access underneath I-10 and above Clairborne Avenue. This allows medical students, doctors, and nurses worry free transportation to and from the several medical buildings located in the area. With an ease of mind, these professionals are able to focus on what is most important, saving lives.